The Silk web browser on your Amazon (Kindle) Fire tablet or Fire phone uses Bing as default search engine. 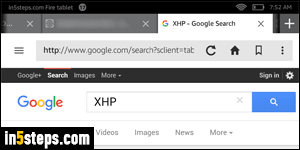 This can change over time, because browser makers often tend to pick their default search engines for self-promotion (like Chrome with Google, and Internet Explorer with Bing), or financial deals (like Firefox with Yahoo). In the case of your Amazon tablet, the "default search engine" is the one that will be used when you search from the address bar. 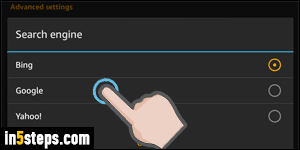 To change the search engine Silk uses by default, tap on the menu button (top left corner). When the side pane opens to the left, tap on Settings. 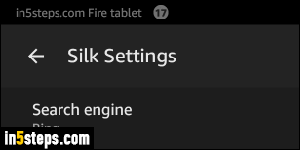 When the Silk Settings screen opens, the first option shown will be Search engine, with the current default being shown below. 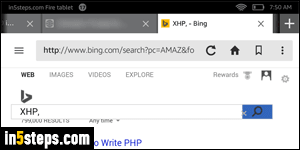 Remember that this only affects searches you make from the address bar: you can still access other search engines by going to their website (google.com, bing.com, yahoo.com, aol.com, or even Amazon). To change your default, tap on that setting. A Search engine popup will open on the screen: currently, the choices are pretty limited - Bing, Google, or Yahoo. It's possible that custom search engines might be supported later on, but that's not the case now. Select the engine you want to use: the popup will close, and the first option's text will be updated.